In case the name of my blog didn't give you know clues about my love for color, this post should clarify things for you. I love color. I love solid color. The things that caught my eye the most at quilt market and the ones that I enjoyed the most were all the solids. Robert Kaufman has new colors in Kona cottons. I went to their "schoolhouse" session and they gave away charm packs of all the new colors. Be still my heart. And at the Kona section of the RK booth, they were handing out new colors cards ALL 243 colors. They were also running an instagram contest (I'm totally addicted to instagram. Want to be instagram buddies? : @liveacolorfullife) You were supposed to take pictures of their displays and post them on instagram with the hashtag #welovecolor (yes, I think they were speaking to me personally). They randomly selected winners. I meant to take loads of pictures. I took one. That's all it took. Guess what?? Yesterday I got an email saying I had won their new book. And it arrived already today! Dear Robert Kaufman: if you are reading this, I definitely love color. We should talk. And the Crayola store was in a shopping center connected to my hotel. Okay, I'll stop talking now and just let the pictures say it all. Crayola should hire this cutie to be their spokesperson. He is that cute. Oooh those Kona colors are to die for! And I could get totally lost in the Crayola store!! Is there anything better than the smell of crayons?? Great post! How dull would the world be without colour! I love the button art! wonderful!!! Congratulations on your win and oh Crayola, even the word makes me smile. Pure joy!! Well, THAT was a colorful post! Very interesting, and I loved it all. Congrats on your win! Oooh, I'm so glad you took so many pictures at the Crayola store - I totally missed that place! What fun it must have been! And congrats on winning the book, it is so perfect for you :) It was so fabulous to get to meet you in person finally, can't believe the trip is over already! He is so cute!! And I love the button picture, I want one too! Congratulations - how lovely to win! I will try and link up with you on Instagram. I love it but don't quite know the ins and outs of it yet. I really want to make a crayon quilt with bright solids. I love all your solid color creations! Especially your granny squares. Your love of color is contagious because I am catching it! I'm with you! I also LOVE color - the brighter the better! oh wow. wow. this is just filled with eye candy. you've made me so happy! Loving all colours, and a whole crayola shop, how fab! Nice score on the book! I loved reading those interesting facts about Crayola crayons too - thank you! Fun post!!! Congratulations on winning the We Love Color book. Very appropriate! The copy I ordered just arrived today too. I haven't had a chance to look at yet but can't wait.. How funny....I happened to find you on Instagram yesterday....you may have to help me figure it out. That must have been amazing to see all those awesome solid fabrics. I do love to work with solids too. Might have to have a closer look at that book. Even cooler to go to a Crayola store. I love those round bins full of crayons. It's like a Crayola museum! How cool! Can't wait to see what you do with your book win! Hey, congratulations on winning the book. It was MEANT for you, for sure. Loved the crayon exhibits--reminds me of the Lego store in New York, where we strolled around, trying to channel our inner child while using the mommy in us to drag out the credit cards. Cool on the new colors! I'm enjoying all your posts--keep 'em coming. 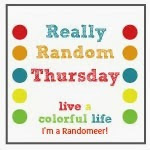 I love Thursday...it means a great Random post..and this one is one of the best. You did a great job of featuring the Crayola Store! Congrats on winning the book, you lucky duck, you!! Congrats! I only posted one photo, too. I loved their booth. Way to go on your win! I love all the color here! Crayola store? I need to check that out! How did I miss the Crayola store? Congratulations! This gift couldn't have founds its way to a better recipient. 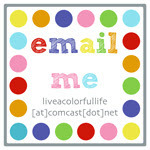 I've always enjoyed your love of color which is why I visit your blog!